Brett Favre, who was a New York Jet only twenty months ago, though it seems like a lifetime, is back in the NFL, and all told, even for him, it feels like the most halfhearted comeback yet. 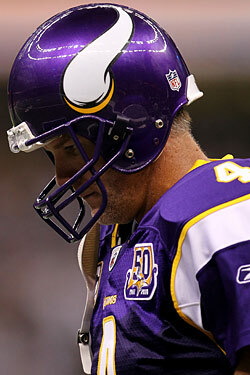 Last year, it made sense for Favre to come back to the Vikings; the team was complete and Super Bowl–ready everywhere other than the quarterback position. He filled the last remaining void. But now, the team is a year older, the best wide receivers are injured, and Favre looks a little lost, like maybe he shouldn't have let those guys fly across the country and talk him into coming back. Though, of course, if they hadn't come, you just know he'd be calling to ask them why not. The Vikings lost to the Saints 14-9 last night in a game that was as dreary as the score. It was a thrilling night in New Orleans, but the game itself almost extinguished all the giddy lunacy. It looked like, well, the first game of the season. Drew Brees was rusty, the coaches were rusty, the kickers were really rusty, and, mostly, Brett Favre looked rusty. He didn't look terrible; his stats — 15 of 27, 171 yards, 1 TD, 1 INT — were not exceptional, but they weren't awful either. But mostly, he looked discouraged. Almost all his completed passes were to tight ends and running backs; he had to go the escape route rather than the downfield one. He wasn't knocked around all that much, but he played like he feared he was going to be, the type of thing you do when you haven't had any training camp and you don't quite trust the guys in front of you. Or it's just something that happens when you're 41. The Vikings aren't as good as they were last year — it's worth noting that they still had a chance to win this game — and Favre won't have his career-best touchdown-to-interception ratio this season, either. It is certainly possible that this season, and Favre's career, could end not with the epic playoff flame-out of last season, but with a simple petering out of the season before the playoffs even happen, like it did after his year in Jets Green. Is that worse? He couldn't finish on a season-ending interception, could he? But he couldn't finish on a down season of simple banal disappointment, could he? Maybe this is why he never leaves.